The aim of the level is to head to the Prancing Pony Inn where Gandalf is waiting for you. Head to the right of the screen and you’ll see a dig spot infront on a character holding a carrot. Switch your character to Sam (Shire) and press and hold the A button on the dig spot. Then when the directional keypad prompt shows, rotate around the directional buttons to reveal a chain and then press and hold the A button again to put it together. Stand under the switch and press the B button to jump up and the door will open. Now head through the door to activate a long cut scene and continue. Aragon Character Token – When the cut scene has finished head to the top of the screen and you’ll see a silver tower; using Sam (Shire)’s character stand in the gold ring and press the A button to set it on fire. When the silver tower has burnt down it will reveal an object, then press the A button to pick up the item and then head to front door of the Prancing Pony Inn where you’ll see a character with a brown box. Place the object in the box by pressing the A button next to the box. Head back to the left and you’ll see a well with a gold ring infront of it. Switch your character to Merry (Shire) and press the A button to fish in the well. Merry will get a box from the well, press the Y button to break up the box and then press and hold the A button to put the LEGO pieces together to create a washing line pulley. Press the A button in front of the pulley to get the washing off the line and then press the A button to pick up the white t-shirt. Head back to the character infront of the Prancing Pony and place the t-shirt in the box. Head to the far right and you’ll see a fenced off area with a target and a box. Press the Y button to break up the box and then press and hold the A button again to put the LEGO pieces together. Switch your character to Pippin (Shire) and press and hold the A button while standing on the box pad. Pick up the object by pressing the A button and then press and hold the Y button to aim at the target, when you have targeted the target release the Y button to throw the object and knock the box off. Pick up the green object and place it in the box at the front of the Prancing Pony to gain the Aragorn Character Token. Pick up the box of object you’ve just created by pressing the A button and head back to the well where you’ll see a silver square on the floor with a white arrow above it. Press the A button to place the box on the pad and then press and hold the A button again to build a dummy. While the horseman enemy is distracted with the dummy head to the gate to the top of the screen and switch your character to Aragorn; then press and hold the Y button to break through the silver padlock and continue to the next area. In this area you can visit the shop where you can buy Characters, Treasure Tokens, Extras and Hints, you can also visit previous levels which you have unlocked for free play, watch the Story Clips and enter Cheat Codes. Infront of the shop you’ll see a tracking pad which rangers can use to gain clues, while still using the Aragorn character press and hold the A button next to the tracking pad to get a tracking clue. Now follow the foot steps to locate the hidden object. When you find the hidden object it will appear and you’ll be able to interact with it by pressing and holding the A button. Press the A button to pick up the object, place it on the krank behind you and press the A button again to krank the handle and open the gate. Make your way to the right and jump over the water to the next platform. Press the Y button to break up the box to the top right of the island and then press and hold the A button to build a bridge from the LEGO pieces. Walk across the bridge to the next island and continue through the circle of light. 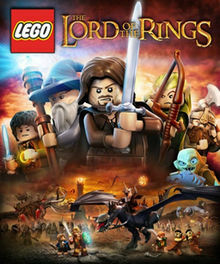 This entry was posted in DS and 3DS, Games, LEGO Lord of the Rings on February 23, 2013 by Tasha.